The second part of MFA thesis project. 3D Educational Poster Design of vegetables. Layout Design inspired by Botanic illustration, 3D poster structure inspired from the previous MRI scan experiment. After the MRI Scan experiment, I began to come up with strategies that could add more emotion to the scientific nature of MRI imagery, so I decided to use materials that people were most familiar with. 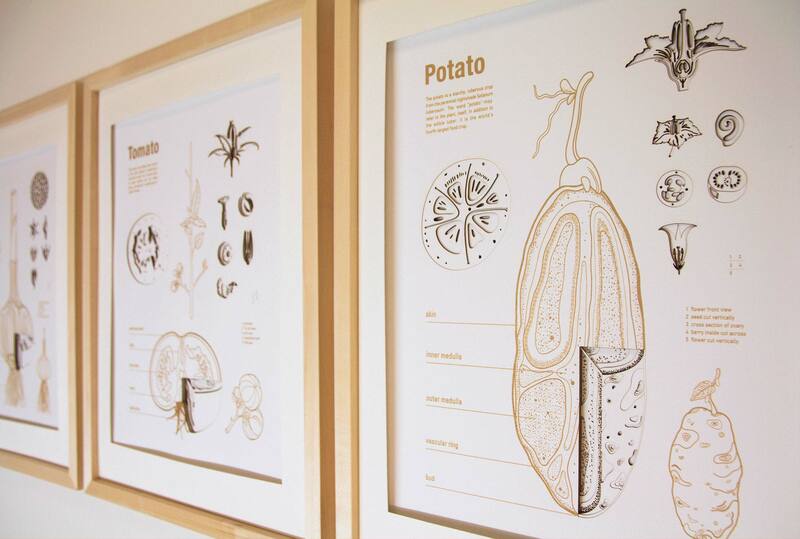 The layout of these posters was inspired by botanic illustrations, which also gave this poster an educational element. The 3D portion of the posters reconstructed the vegetables’ structure and made the poster more attractive. In terms of the material, I used only paper and a laser cutter. Additionally, I used laser engraving for the lettering on the posters, to avoid ink, as I wanted to keep the poster simple and less artificial. These posters were displayed in JHU. During the exhibition people were wondering if there was more interactive medium that they could play with, so I thought about adding a digital component to this project, which led to the app design.